The Victorian Alps is home to some of Australia’s highest mountains and offers some excellent and diverse skiing conditions. Mt Hotham, Mt Buller and Falls Creek are three of Victoria’s largest and most popular ski resorts. We will profile and compare all three of these resorts side-by-side. Mt Hotham ski resort and Mt Buller ski resort both have their own unique features as ski resorts. Mt Hotham is often titled as a real skier’s destination amidst aggressive terrain coupled with more snow than other Victorian ski resorts. Mt Buller is highly popular, due to its proximity to Melbourne, which has made it a very popular weekend-away destination. Skiers describe Mt Hotham as an upside-down ski resort because the village locates itself above the vast majority of terrain, meaning you ski down to the chairlift from your lodging every morning. With approximately 50km of trails plus access to lots of off-piste terrain, Mt Hotham caters more for intermediate and advanced skiers and boarders. Accommodation is in both Mt Hotham and Dinner Plain, which is about 15 minutes down the road. The town, which sprawls along the mountain road between these 2 villages, has a real skier’s vibe to it with hangout bars to hideaway in after a day on the slopes. Mt Hotham is also the only resort in Australia with an airport. Depending on the year and the whim of the airlines there are direct flights from Melbourne and Sydney. You can land and be skiing within half an hour. Please check with the Mt Hotham to confirm flight accessibility. Mt Buller is just a 3hr drive from Melbourne. Its proximity makes it one of Australia’s busiest and modern ski resorts with entertainment for all ages whether it’s the gnome hunt that kids love, Australia’s highest day spa or visiting one of many late-night wine bars. Mt Buller caters well to skiers, après-skiers and non-skiers alike. Mt Buller offers a larger more modernised ski area that spans 80kms reaching up to 1780m from 22 ski lifts. The pistes are ideal for all abilities with long runs for beginners to get up to speed and high-speed lifts to carry intermediate and advanced skiers to their preferred areas. Mt Buller ski resort and Falls Creek ski resort are often compared to each other as they offer Victoria’s most extensive ski areas coupled with family friendly activities. The highly popular Mt Buller ski resort is an all-rounder whereas Falls Creek is generally thought of as the leader in family-friendly ski resorts due to its terrain and village layout. Falls Creek uniquely provides almost entirely ski-in ski-out accommodation whilst being nestled amongst the Australian gumtrees. This makes it easy for families removing the hassle of lugging equipment around town whilst keeping an eye on the kids. You might be able to sneak in a bar hop without venturing too far from the family as the beautiful compact village has lots of restaurants and bars dotted around. The skiing on offer is rather extensive, certainly by Australian standards. Mt Buller has options for all ski abilities with snaking beginner runs towards the lower village slopes and better skiers can explore the 80kms of groomers up to 1780m easily accessed by their 22 lifts. Falls Creek does not feature much steep terrain, rather, there is more lightly pitched skiing on long intermediate trails. Served by 14 lifts with 64kms of piste. Falls Creek is also home to 65km of X-Country skiing. The Kangaroo Hoppet is held here, Australia’s premier long distance cross country ski race, along with the prestigious Worldloppet series of international cross country ski events. 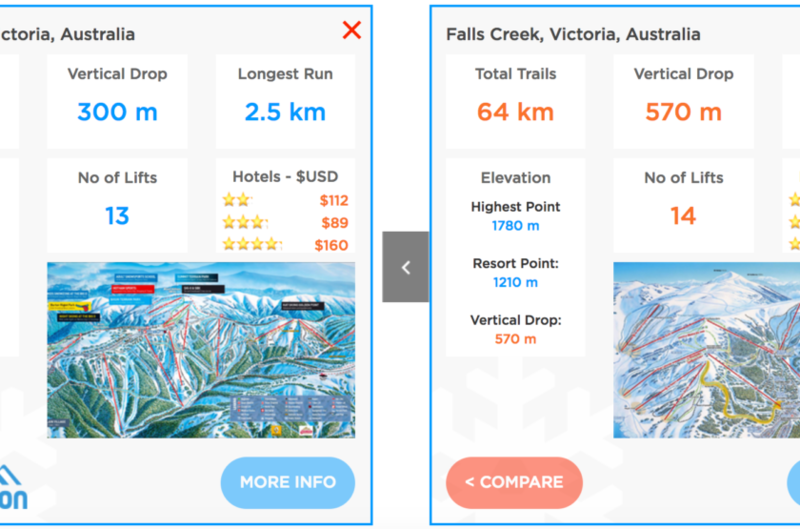 Falls Creek ski resort and Mt Hotham ski resort are Victoria’s most contrasting ski areas, with a distinct difference in both the ski style and resort experience. Falls Creek is an easy going family oriented ski resort with ski-in-ski-out lodging that makes full in-resort snow experience. Mt Hotham has steeper more aggressive terrain suitable for advanced adventurous skiers and a more social après-ski atmosphere. Falls Creek has an excellent range of options that will suit all budgets. Children and families will feel more at home in Falls Creek with activities to keep everyone entertained whether you want to test out your skills in fun organised ski races or take part in a local treasure hunt. The lodges and hotels are neatly placed lining the slopes so you can ski down to your ski school or first lift of the morning. Mt Hotham does share one feature with Falls Creek, the ability to ski to your first lift every morning but in a slightly different way. The unique design to the Mt Hotham means that the village actually sits above the majority of skiable terrain. There are fewer off-the-snow activities on offer here, it really is a skier’s heaven for those who simply want to ski and board hard all day then relax with a good meal or a drink in a local bar. Falls Creek is there to provide a more family-focused holiday that you can comfortably hone your skills on the smoothly pitched slopes. Mt Hotham is for the ski addict, even if it’s for a swift weekend break you can fly into the airport and revel in some of the best snow depths in Australia.